It has been well known that Facebook has a lower age limit and actively discourages non teenagers from adding a profile. Loved the news today about the 104 year old woman who wants a FB page but can't have one. When she puts in her date of birth as 1908 it keeps changing the date to 1928 making her 84 - younger than both Gran and Nana!! At 104 you really wouldn't want to hide your age. 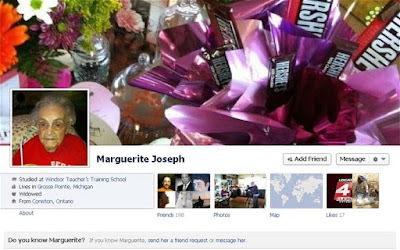 Tell you what I bet Marguerite has a whole lot more friends today! !